Winemaker’s Notes: Chapoutier makes “portraits of the terroir,” and Occultum Lapidem will transport you to the Roussillon. Smell the violets, resinous scrub, even a whiff of iodine from the distant Mediterranean. The warmth, spices and resinous herbs of Provence that infuse the wine are telltale signs of its origin, along with the wine’s mineral notes and firm, yet ultra-smooth, tannins from its rocky, old vineyard. Plum, blackberry, black cherry, dried raspberry fruits fill the mouth and long finish. But, here in the Roussillon, compared to the Rhône, it is typically spice and herbal notes — rosemary, thyme, pepper, nutmeg, walnuts, licorice — not the fruit that dominates. My Review: I’ve had a lot of Michel Chapoutier wines over the years (especially of late), and while they don’t always blow me away, they’ve never disappointed me, and that’s worth something. 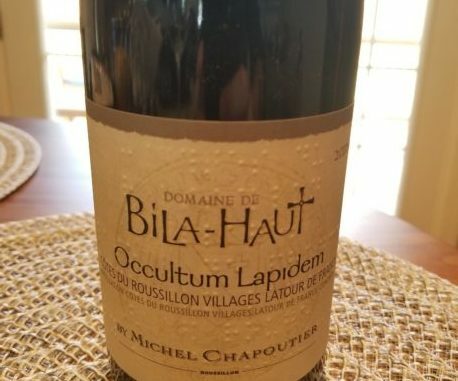 Because of that, I’m always happy to try new blends, vintages, and bottlings from the winemaker, and the 2016 Bila-Haut Occultum Lapidem Rouge was no exception. In the glass the wine was an inky reddish purple color, and on the nose I picked up aromas of dark fruit and a jamminess. In the mouth the wine showed some heat at first blush (not surprising given the 15% alc/vol), but that quickly gave way to favors of dried fruit, with a jammy mid-palate, and a notes of spice and licorice towards the end. My wife and I didn’t pair the wine with anything, choosing instead to sip on it by itself, but the higher alcohol content and dry front notes made me want to pair it with something juicy – a medium-rare steak or saucy pasta; something to provide some acid and balance to the dryness of the wine. All that being said, I really liked this wine; the price-point is fair, it’s well balanced, and I’d be happy to share this with friends. A good value.